Break the bread into pieces. In a large bowl, soak the bread in the half-and-half until the liquid is absorbed, about 2 minutes. Mix in the chicken, egg, salt, pepper, dill, and the 3 tablespoons room-temperature butter. Put in the freezer for about 10 minutes to firm up. Remove the chicken mixture from the freezer; it will still be very soft. 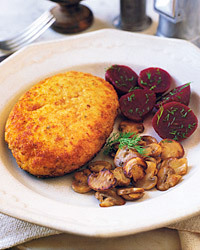 Form the mixture into four oval cutlets and coat them with the bread crumbs. In a large, nonstick frying pan, heat the remaining 2 tablespoons butter and the oil over moderate heat. Cook the cutlets until golden brown and just done, 4 to 5 minutes per side. Variation: Italian-Style Chicken Cutlets Omit the dill. Use half bread crumbs, half grated Parmesan cheese to coat the cutlets. Sautéed mushrooms are the traditional Russian accompaniment to chicken cutlets. Beets, glazed carrots, and mashed potatoes are other excellent possibilities. The butteriness of the juicy cutlets contrasts beautifully with the racy freshness of an uncomplicated red wine. A Beaujolais from France or a Merlot from Trentino in Northern Italy or will be perfect.